The banana is a lengthy yellow fruit, found in the market in groups of three to twenty fruits, similar to a triangular cucumber, oblong and normally yellow. Its flavour is more or less sweet, depending on the variety. The banana is rich in fibre, potassium and some beneficial vitamins for health. It is a good fruit for everybody except for diabetic and obese people, due to its high starch and sugar contents. 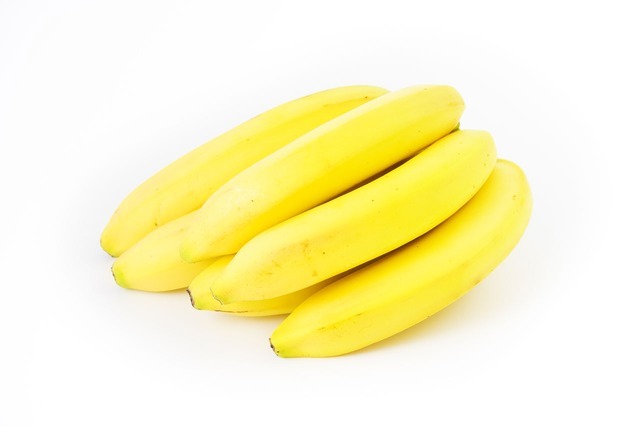 The banana is a yellow lengthy fruit, found in the market in groups of three to twenty, similar to a triangular cucumber, oblong and normally yellow. Its taste is more or less sweet, depending on the variety. There is confusion concerning the name. In all the countries of the world except Spain, it is known with one name if cooked and another name when talking about the ripe fruit that is consumed in fresh. In Spain banana is the fruit consumed in fresh and the other name does not practically exist. Nevertheless, nowadays any type of banana is used in many different ways and bananas belong to a sub-group of cultivars. The consumption of fresh bananas as dessert is very usual, even fried, but other bananas, such as the male banana, are cooked and consumed when they are still green. A part of the ripe bananas is used to produce crunchy slices of dehydrated banana, or even banana flour. 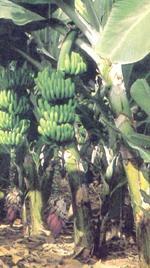 In some areas of Eastern Africa, ripe bananas are used to make a low alcohol beer. Other products are puree, juice, liquor and sweets. Furthermore, this fruit is a good source of energy, with an energetic value of 88 to 95kcal/100g, and an important source of vitamin A and potassium. Some varieties are distinguished according to their difference of size, colour (green, yellow or red), more or less sweet taste and their consumption. Bananas can be harvested all the year round, there may even be three harvestings in a year and its amount depends on the season. Those intended for export are harvested green and taken in freezer boats to their place of destination. Later on, they mature quite easily in equipped cold storage rooms. During maturation, the fruit starch turns into sugar while the aromatic substances and the acids that balance sweetness are formed. Once mature, they should not be kept in the freezer because they loose taste and they can be damaged with the cold temperature . The banana tree is an herbaceous plant with very great and showy leaves, whose real stem is a bulb which sprouts every year. The inflorescence gives rise to ‘hands’ generally formed by ‘fingers’, that are the yellow fruits. The banana belongs to the Musaceous family and the Musa type. In the tropical and subtropical areas, this family is only represented by 6 genus and 220 species, of which 50 or 60 belong to the Musa type. This is divided in two subgenus, the Australimusa, based in the Pacific area, with no commercial importance. Another, the Eumuds, native of Asia; to this group belong the standard bananas, the variety of bananas whose importance surpasses the rest. The Musa genus is divided in five sections, of which the Eumusa section includes two species, Musa acuminata Colla and Musa balbisiana Colla, from which all the parthenocarpic bananasoriginate . This genus comprises species that contain seeds, as well as an important amount of cultivars with parthenocarpic fruits. The banana tree is an herbaceous ‘perennial’ plant, since after fructification its aerial parts die, but are replaced by new sprouts that grow from the base. The highest types of the Cavendish series reach almost 8m high; although the normal height is between 3 and 6m. The real stem of the plant is an underground organ that is only visible outside the ground at the time of flowering. It is called bulb or corm, and is also known as head or strain, it has at the same time the characteristics of a rhizome and a bulb. It is an important device of storage, formed by a central cylinder surrounded by a protective cortex from which the roots, flowers and sprouts emerge; they will continue with the life of the plant. The root is superficial, although in the Canary Islands for example, they can deepen until they reach 1m. The leaves are very big, 2 to 4m long and even half meter wide, with a 1m or even longer stalk and elongate elliptical limb, slightly decurrent towards the stalk, little waved and glabrous. From the leaves crown, during the flowering, grows a pubescent scape, 5 to 6cm of diameter, finishing in a hanging cluster, 1-2m long. This cluster carries twenty oval and long bracts, acute, of red purple colour, covered by a whitish dust; from the axils of these bracts the flowers grow. The inflorescence is quite complex. Throughout the axis, the bracts (red in the Cavendish sub-group) are arranged in spiral, identical to the foliar system. Each bract covers a group of flowers deprived of individual bract and arranged in two twin rows. They are hermaphrodite, but only those that can be seen after the fold of the bracts are female, and will bear bananas or ‘fingers’ that contain 3 to 20 fruits, known as ‘hands’. The fruit is oblong, with the shape of a triangular cucumber, green at the beginning and yellow when ripe, although the colour may vary according to the cultivar; when it blacken, it falls of the tree, reason why it is collected before it matures.